Extracting the Cafu zip package for installation creates a new directory on your hard-disk that contains all Cafu related files. This section provides an overview of how the most important subdirectories and their contents are structured. Cafu-9.06 This is the top-level directory that contains everything else that is related to this release of Cafu. ExtLibs A directory that contains external libraries. These are auxiliary libraries by other parties that Cafu relies upon. You don't need them for normal use, but if you compile your own game DLL or other Cafu programs, the compiler and linker will refer to the header and object files here. Projects This directory contains all the actual, Cafu specific programs and content (both the Cafu libraries as well as the Cafu engine itself). Cafu This is the Cafu engine itself, and all its related programs and content. CaWE A set of auxiliary files that CaWE, the Cafu World Editor, loads on startup. Fonts This directory contains definition files for the fonts that are used on all Cafu graphical user interfaces (“GUIs”). Examples include the 2D GUIs like the main menu that you see right after program start, as well as the 3D GUIs that you encounter in-game throughout the Cafu worlds. Games The Cafu engine loads game implementations (MODs) dynamically. Each subdirectory herein contains a separate game, and everything that is specific to that game. DeathMatch This is the first (and currently only) “example game” that comes with Cafu. If you want to make your own MOD or game, you might want to start by duplicating this directory, placing the duplicate next to it and then start modifying it. Code All the C++ headers and code for the DeathMatch game are here. It also contains a precompiled DLL so that it works for everyone right out of the box. GUIs The scripts that define all the 2D and 3D GUIs are contained here. 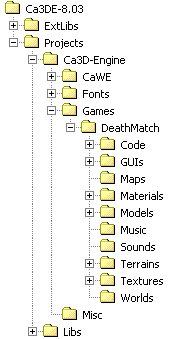 Maps The map files in their “source-code” form: When you edit a map with CaWE, it is loaded and saved here. Materials Materials define the looks of all surfaces. Their definitions are stored in cmat files here. Models All model files (e.g. for player models, monsters, etc.) are kept in this directory. Music The mp3 and ogg music files that play at level start are stored here. Sounds Sound effect files like shotgun or pistol shots, explosions etc. are placed in this directory. Terrains The terrain files are all kept here. Textures This directory contains the source texture images that the materials (see Materials directory) refer to. Worlds This directory contains the maps after they have been processed and compiled by the Cafu compile tools. These are the world files that the Cafu engine loads when a new level begins. The CaWE documentation explains how maps (from the Maps directory) are compiled into the world files (that are kept here). Misc This directory contains miscellaneous auxiliary files for the Cafu engine. Libs These are our program libraries that are specific to Cafu, developed exclusively by Carsten Fuchs Software for Cafu. Normal releases only contain a subset of the C++ header and object files that are required to build new game DLLs. The complete set of libraries as well as their implementation is included with the Cafu source-code edition.